Bellator 214 — which is set to go down on January 26, 2019 inside The Forum in Inglewood, California — just got a bit more interesting, as the promotion announced that Gegard Mousasi will defend his Middleweight title against Rafael Lovato Jr in the co-main event. Mousasi is fresh of a title defense against Welterweight champion Rory MacDonald, absolutely wrecking “Red King” (see it) to collect his eighth straight win stemming back from his days competing for Ultimate Fighting Championship (UFC). The victory was Gegard’s third in a row for the Viacom-owned promotion. As for Lovato, the former Legacy FC 185-pound kingpin hasn’t tasted defeat in his career, going 9-0 so far, with five of those wins coming under the Bellator MMA umbrella. The submission wizard was last seen submitting John Salter at Bellator 205. Bellator 214 is expected to be headlined by the finale of the promotion’s Heavyweight Grand Prix, as Fedor Emelianenko will face Ryan Bader for all the marbles after the two hard-hitting men ran the gauntlet to reach the finals. UFC 233 — which is set to go down the same night in Anaheim, California — will feature perhaps the final Flyweight fight for the promotion, as T.J. Dillashaw will drop down to face current champion, Henry Cejudo. Also, Robbie Lawler will welcome Ben Askren to the Octagon, while Paul Felder and James Vick collide in Lightweight action. There wont be a shortage of fights for fans to enjoy come January 26, so the question remains: Which one will you be tuning in to? Bellator MMA’s Jan. 26 tent-pole event just got a little bit bigger. Fresh off his triumph at Bellator 206, middleweight champion Gegard Mousasi has called for a rematch against one of Bellator MMA’s newest acquisitions in Lyoto Machida. In case you were wondering, the best welterweight in Bellator is no match for the best middleweight in Bellator. In the main event of Bellator 206, champ Rory MacDonald said, “Screw it, I’m going to see how I do against champ Gegard Mousasi,” and the results weren’t pretty. First of all, MacDonald got tore up on the feet. Mousasi – long time an ace striker – was just too fast and too accurate with his jab and kicks. A few times MacDonald got through and landed something, but he was otherwise toast in the stand-up department. Not feeling the love on the feet, MacDonald said, “Screw it, I’m going to try one of those rolling techniques that Japanese leglock specialists used to do back in the day.” But Mousasi simply stuffed him, took mount, and beat the living daylights out of him. This was an intriguing fight on paper because it had the best of two divisions going at it. But in reality, it wasn’t close. The post Bellator 206 Results: Gegard Mousasi Eats Rory MacDonald for Dinner, Spits Out His Bones appeared first on Caged Insider. Bellator 206 ‘Mousasi Vs MacDonald’ Recap & Highlights! Bellator 206 ‘Mousasi vs MacDonald’ aired Sat. night (Sept. 29, 2018) from SAP Center in San Jose, Calif. MMA Mania brings you a post-fight recap, results, .gifs and interview highlights from a card where Rory MacDonald went up to 185 lbs. to challenge Gegard Mousasi! Bellator 206: “Mousasi vs. MacDonald” took place last night (Sat., Sept. 29, 2018) at SAP Center in San Jose, California. 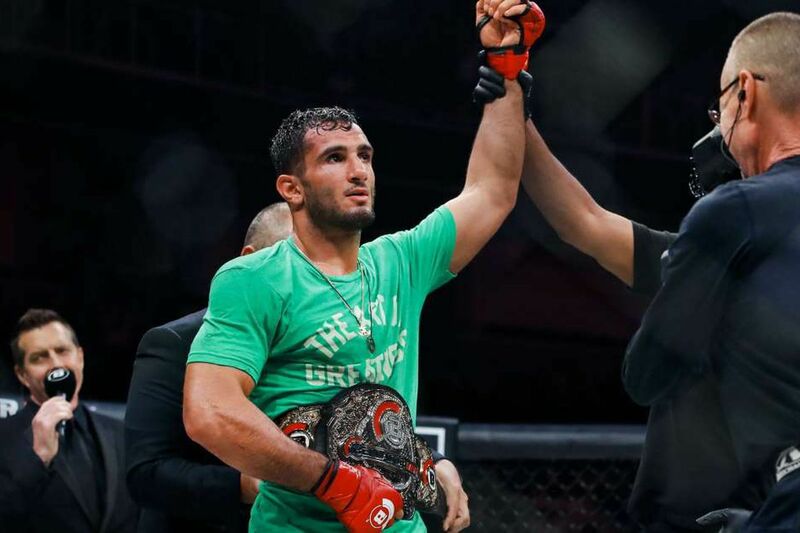 Gegard Mousasi (44-6-2) put his title on the line as Rory MacDonald (20-4) came up from Welterweight to Middleweight to seek a second belt to put around his waist. The size difference was as apparent in Round 1 as was Mousasi’s power, as he repeatedly snapped MacDonald’s head back with his jab, and when MacDonald could land it didn’t seem to cause any damage in return. He forced MacDonald to fight off his back foot for nearly the entire round. Things went from bad to worse for MacDonald in round two. He dove for a leg looking for a submission and Mousasi was not snake bit. In fact the opposite happened – he immediately busted MacDonald wide open, worked his way to the full mount near the three minute mark, then poured on the fists and elbows until Herb Dean stopped it at 3:23 by TKO. Mousasi spoke to “Big” John McCarthy after his impressive Middleweight title defense. In the co-main event two legendary warriors meet for the fourth time as Quinton “Rampage” Jackson (37-13) and Wanderlei Silva (35-13-1-1) met in a clash of Heavyweight titans. DAZN made sure to bring MMA fans the pre-fight breakdown of their respective stats. As Mauro Ranallo is fond of saying, “MOMMA MIA.” This fight was contested entirely on the feet, with Jackson working the left jab to set up the right hook, and Silva clinching when necessary and firing counter strikes when available. Silva got tired of the cautious forward movement of Jackson early and dared him to go for broke. When Jackson rocked him late in round one and Silva started backpedaling, Jackson returned the favor and goaded his foe. Mike Beltran kept law and order between rounds until they could come out and restart the fireworks. Jackson’s timing was largely on point as he read Silva’s strikes and either ducked the windmilling blows or sidestepped the kicks. He’d rock Silva and Silva would hang on trying to clear his head, but four minutes in Jackson landed an emphatic right that Silva’s chin could no longer withstand, pouring it on until Beltran awarded a TKO at 4:32. “Big” John McCarthy stepped in to talk to the victorious “Rampage” Jackson afterward. Kicking off the Welterweight Grand Prix in Bellator was an opening round bout between two former champions — Douglas Lima (29-7) and Andrey Koreshkov (21-2). The first round was almost a stalemate. The crowd grew frustrated with referee Josh Rosenthal’s lack of separation as Koreshkov tried and failed to get multiple takedowns, lifting Lima high in the air a couple of times, but Lima always landed on his feet. The second round was dominantly for Lima. He landed multiple leg kicks to Koreshkov and John McCarthy raved on commentary about the power and technique. Koreshkov’s only response was to stall against the fence. He didn’t seem to land any effective strikes the entire five minutes. The third round was essentially “rinse lather repeat” of the second. After a fourth round that looked a lot like the previous two until the clapper, Lima landed a hard right hand that momentarily made Koreshkov wobble on his feet, and he charged forward to pour it on against the fence until the bell. Lima had a big lead going into Round 5. The exclamation point on the bout for Douglas Lima was a sprawl to block a takedown that gave him a dominant position on the ground, throwing multiple lefts and rights from Koreshkov’s back, then taking the back with both hooks in for a tight rear-naked choke. Koreshkov had never been submitted before in his career, and perhaps was unwilling to let this be the first time he tapped, so he simply went out cold and Rosenthal broke the hold. The official time of the technical submission was 3:04. Lima spoke to McCarthy afterward. Featherweight young gun Aaron Pico (3-1) was put to work again versus the much more experienced Leandro Higo (18-4). Aaron Pico once again showed his ability to outwork and out-strike vastly more experienced opponents. The scary thing is that Higo was clearly out on his feet after being rocked a second time halfway through the round, but referee Mark Smith didn’t step in until Higo stumbled and fell trying a back fist. Pico spoke to John McCarthy afterward. Also on the main card was a Strawweight bout between Keri Taylor-Melendez (2-0) and the debuting Dakota Zimmerman. Melendez was winning most of the first round after a takedown and a huge slam, but Zimmerman capitalized on a momentary positional mistake and trapped an arm, then wrapped her legs around Melendez’ head and made her stay on defense until the bell, giving Zimmerman a potential scorecard lead early in the fight. Zimmerman tried multiple times to get a takedown in Round 2 to no avail, pulled guard a couple of times, and each time Melendez calmly walked her across the cage. The second time Melendez shook her off and landed almost a dozen unanswered knee strikes to the body to tie things up going into the third frame. There was an urgency to Zimmerman’s forward aggression to open the last round as though she knew it was too close to call, but the one takedown she landed was almost instantly neutralized as Melendez pushed off the fence with her feet to get a sweep. She landed a couple of upkicks when Melendez escaped but not directly enough to rock her, and she pulled guard late and let Melendez finish the fight on top. Two of the three judges scored it 29-28 for Melendez to earn the split decision, while one judge gave a 29-28 to Zimmerman. No post-fight interview followed. Rounding out DAZN action was a Featherweight bout between Gaston Bolanos (3-1) and Ysidro Gutierrez (4-2). Bolanos landed head kicks several times throughout the first round but missed with his signature spinning elbow. Due to his high rate of activity and a few takedowns he clearly took the the opening frame 10-9. The second round saw the “Dream Killer” blow Gutierrez out of the water by landing a powerful left hand behind the ear and multiple right hands from behind on the ground, forcing referee Mike Beltran to save a defenseless man at 1:37.
.@DreamkillerMT doing exactly what his name suggests! Bolanos spoke to “Big” John McCarthy afterward about his impressive knockout win. He also had more to say backstage after the in cage interview.
.@DreamkillerMT talks about his 3rd straight knockout at #Bellator206. 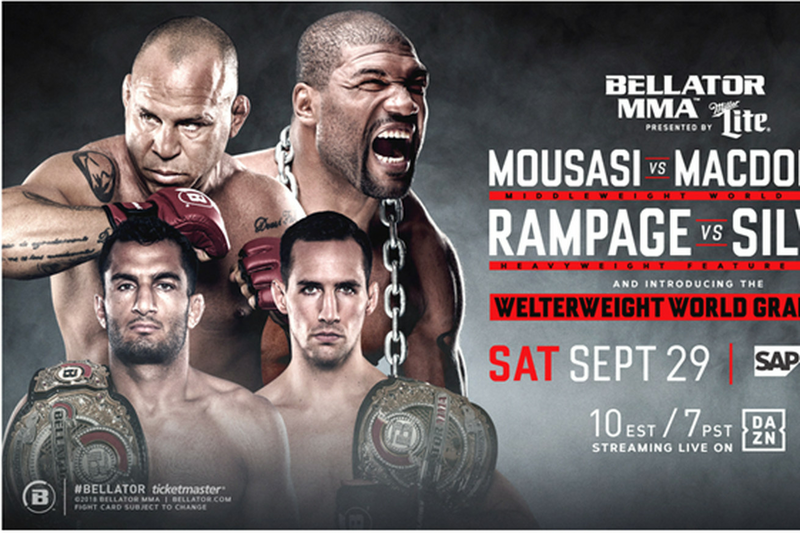 For complete Bellator 206 results and coverage click here.